If you need a fireplace insert for your home, get a free quote from Chicago’s experts at Early Times Home Solutions. Fireplace inserts are the perfect way to add a fireplace to your home without any hassle. They offer many benefits from preventing drafts to producing real heat. Plus, they’re as aesthetically pleasing as a wood burning masonry fireplace. Early Times is Chicago’s fireplace expert. We’ll make sure your fireplace insert is installed correctly and looks great. It’s no wonder why thousands of homeowners have trusted us with their home improvement needs. Get a free quote now and get started on your fireplace project today. A fireplace insert is exactly what it sounds like: it’s a fireplace unit that’s installed in an already existing fireplace. They’re usually put into already established masonry fireplaces. You’re probably wondering why you would put a fireplace within a fireplace. That’s because fireplace inserts have many benefits that are unique to them. We’ll go over a few of them below. With an open chimney, there’s always the risk of drafts getting into your home. This is further escalated if you have a damaged or broken fireplace damper. Installing a fireplace insert can prevent drafts from entering your home and eliminate the need for a damper. They do this by blocking off the chimney and preventing drafts from coming down it and into your home. This helps improve your home’s energy efficiency by making it easier for your furnace or fireplace to heat your home. You’ll see a drastic difference in your heating bills. Did you know that 90% of the heat produced by a normal fireplace escapes through the chimney? This problem is a thing of the past with a fireplace insert. The heat is trapped in your home and makes it more comfortable. In fact, expect up to 8 hours of heat per burning session. There are a couple of different styles of fireplace inserts available. You can go with a more traditional wood burning insert or maybe you’d prefer the gas fireplace insert. Both options are safe and beautiful. You can get which ever style you prefer. Most importantly, fireplace inserts are much less expensive. You won’t have to pay as much for them to be installed, they have less maintenance costs and your heating bills will be lower with their fantastic energy efficiency. As you already know, there are a couple different types of fireplace inserts. We’ll go over each one below in more detail so you have a better idea which one is right for you. Many people associate gas fireplace inserts with danger, but we want you to know that there’s nothing unsafe about a gas fireplace – you should feel completely safe using a gas fireplace insert. Just make sure that it’s installed by a professional such as Early Times. Now that that’s out of the way, let’s get to the benefits of a gas fireplace insert. Gas fireplace inserts have an extremely high efficiency rating (92% – 99% vs 60% – 80%). No heat will be able to escape your chimney. This is also the reason you’ll save a lot of money on your heating bills. With such a high efficiency rating, you also have the benefits of having a greener fireplace. Very little smoke and pollution occur with gas fireplace inserts. Also, maintenance of a gas fireplace is very low. You won’t have to worry about burning anything that leaves a major mess behind. Just make sure you get a chimney inspection every year to make sure your chimney doesn’t need to be cleaned. Don’t think that wood burning fireplace inserts don’t have any benefits. For starters, they’re very inexpensive to use. The cost of firewood is inexpensive or, if you live by woods, you can chop your own fireplace wood. Wood fireplace inserts are known for their traditional look and beauty. You don’t get the same snap and crackle of a burning piece of wood anywhere else – it’s extremely calming. There isn’t much that can compare to their look and feel, especially when you have a fire going. Fireplace inserts are a fantastic addition to any home in Chicago. They produce a beautiful fire and warmth without the fear of drafts getting into your home when it’s not in use. You have a couple of different options available as well. Both gas and wood fireplace inserts have benefits that the other doesn’t offer. You need to determine which is best for your home. 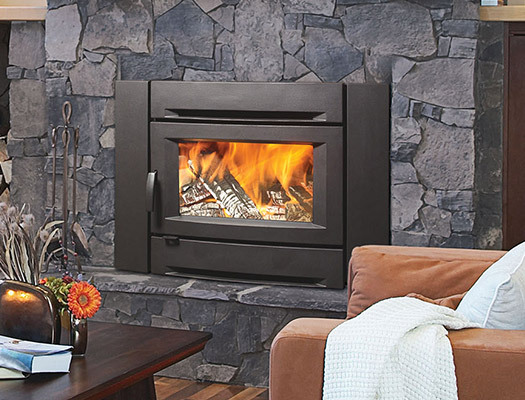 Whether you’re looking for gas or wood fireplace inserts, Early Times Home Solutions is here to help. We’re Chicago’s fireplace experts and have helped thousands of homeowners with their home improvement needs. Get a free quote now and we can get started on your fireplace insert today.